Rectal adenocarcinoma with mucinous components is an uncommon type of rectal cancer with two distinct histologic subtypes: mucinous adenocarcinoma and signet-ring cell carcinoma. Mucin can also be identified as pattern of response after neoadjuvant treatment. 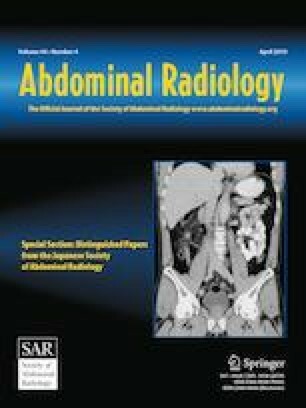 On imaging modalities, mucin typically demonstrates high signal intensity on T2-weighted images, low attenuation on computed tomography, and may be negative on 18-fluorodeoxyglucose positron emission tomography. After neoadjuvant CRT, cellular and acellular mucin share similar imaging features, and differentiating them is currently the main challenge faced by radiologists. Radiologists should be aware of pros, cons, and limitations of each imaging modality in the primary staging and restaging to avoid misinterpretation of the radiological findings. This work was supported in part through the NIH/NCI Cancer Center Support Grant P30 CA008748. This article does not contain any studies with human participants or animals performed by any of the authors. For this type of study formal consent is not required. Network NCC. Clinical Practice Guidelines in Oncology (NCCN Guidelines) Colon Cancer. Version 1.2018. https://www.nccn.org/professionals/physician_gls/pdf/colon.pdf. Published 2018.01.30.2018.